The Malabar Coast in the south is famous for its spices of pungent aromas that lured many foreign invaders like the Dutch, the French and the English. Cardamom, pepper, cinnamon, cloves and nutmeg are some of the notable spices, which are found in abundance in the South. The availability of coconut, fish and root tubers have influenced the culinary creations of the South. 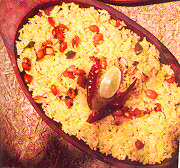 Rice is the staple food for the people of the four states of South India. The very mentioning of the name of South India, particularly Tamil Nadu, brings to ones mind the tastes of Idlis, dosas, Sambhar and Vada. But there are more than these that can treat the taste buds. Most of the vegetarian and non-vegetarian dishes of this region have a generous use of spices and coconuts. The final tempering with oil, mustard seeds, curry leaves, red chillies and urad dhal is almost the same for most of the dishes. In Kerala, the staple food of the people is fish accompanied with steaming rice of big size. Banana chips and jackfruit chips are the specialty snacks of this state and most of the visitors make sure they have at least a few bags of these items in their carry home luggage! The Andhra cuisine has a great Mughal impact. Their food is known for its spiciness and hotness. The kebabs and the Briyanis are not to be missed. Home made pickles, pappads and dry chutney powders to be used with dosa or idli or rice are the famous culinary traditions of this region. Take the cooked vegetables and add the ground paste, salt and curd and simmer on low flame for some minutes. Then temper with coconut oil, mustard seeds and curry leaves. Cut the ladys fingers to 1.5 cm pieces. Whip the curd with turmeric powder. Take oil in a pan and season it with mustard seeds, fenugreek seeds, red chillies and curry leaves. When the mustard crackles add the sliced onions and green chillies and saute well. Add the ladies finger and fry well. Finally add the whipped curd, salt to taste and simmer on low heat. Serve hot laced with coconut oil. Cook the arhar dal with turmeric powder and half a litre of water. Strain the dal and mash it. Soak the tamarind in warm water and sieve it to get the juice. Bring one cup water to boil and add the chopped tomatoes, tamarind juice, asfoetida, chopped coriander, curry leaves and rasam powder. Heat ghee and temper it with mustard seeds and red chillies and pour over the rasam. Cook the dal after cleaning and mash it well. Chop the mixed vegetables into pieces and add them to the cooked dal. Add the onions, boil and keep aside. Roast the asfoetida, fenugreek seeds and coriander seeds in oil and grind it with coconut and tamarind to form a smooth paste. Add this to the dal mixture and then add turmeric powder, salt and a little water and boil for a minute. Heat oil and add the mustard seeds and curry leaves and when the mustard crackles add this to the dal. Serve hot with steaming rice or idli. Cut the jackfruit into quarters and cut off the white pith on top. With oil greased hands, remove the seeds and slice to thin slices. Cook the pieces with salt and enough water. Grind the cumin seeds, green chillies, turmeric powder, coconut and onion. Mix this ground masala with the cooked jackfruit and cook for a few minutes. Heat oil and add the curry leaves and mustard seeds and when the seeds splutter, add the sliced onions and fry till brown. Add this to the jackfruit mixture and cook for few minutes and serve hot. Cut the pumpkin into large pieces and cook in a pressure cooker till one whistle. Grate the coconut and grind it with coriander powder, ginger, and red chillies. Grind the chana dal separately. Fry the pumpkin and add the chana dal cook well. Add the ground masala, stir and remove from fire and serve hot with rice. Slice the yam and banana into 1-inch pieces after removing the skin. Cook them with water 1 cup and turmeric powder. Grind the peppercorns and mix with the vegetables and cook on slow fire for a few minutes. Grind the coconut coarsely with the rice. Heat the coconut oil and fry the ground coconut and add the yam and banana, coconut paste and salt. Cook till done, then season with coconut oil and mustard seeds and curry leaves. Roast the semolina till brown. Parboil the cauliflower, peas and carrot. Heat the oil, add the mustard seeds, chana dal, and urad dal and curry leaves. Fry the onions till transparent and fry the tomatoes till the oil floats on top. Add the parboiled vegetables, salt and water. When the water begins to boil, gradually add the roasted semolina, stirring constantly. Cook the rice till half done. Heat the oil and add mustard seeds, urad dal, chana dal, red chillies and curry leaves. Add the chopped ginger and green chillies and toss. Add the turmeric powder, asfoetida, salt and rice and toss. Sprinkle lemon juice over this and cook for a few minutes. Serve hot garnished with fried groundnuts and chopped coriander leaves. Heat the oil and temper with the mustard seeds, urad dal, red chillies and curry leaves. When the mustard crackles add the chopped onions and green chilies and fry till the onions are brown. Add grated coconut and stir without allowing the mixture to get brown. Add the cooked rice, coriander leaves, mix well and remove fire. Cook the rice and when cool mix the curd with it thoroughly. Heat the oil and add the mustard seeds, red chillies and curry leaves. When the mustard crackles add the green chillies , ginger and salt and pour over the rice mixture. Garnish with cashew nuts and coriander leaves and serve cold. In south India, fish is the main constituent of non-vegetarian dishes though chicken and mutton are used sparingly and on special occasions. And the dishes have coconut milk or oil or gratings as the main ingredient, which give them their characteristic taste and smell. Unlike the north, mutton and chicken are not marinated in vinegar and used. The non-vegetarian dishes are usually too spicy and hot in the South, which is their specialty. Grind the coconut and take the first thick and second thinner milk. Heat the oil and fry the green chillies, ginger, peppercorns, cloves and cinnamon and then add the mutton and fry for few minutes. Add the thin coconut milk with salt and pressure cook till well done. Finally add the thick milk and stir. Heat a little oil and fry the onion slices and coconut slices to brown and add to the stew and serve hot. Devein and clean the prawns. Mix all the ingredients except the oil and apply over the prawns and marinate it for an hour. Heat oil in a shallow pan and deep fry till brown or well cooked. Garnish with rings of onions and fried curry leaves. Cut the pomfrets into fillets. Grind the coconut and take half cup of thick milk, half a cup of second extract and half a cup of third extract. Heat the oil and add the mustard seeds and when it splutters add the ginger, garlic, green chillies and onion and fry till the onion turns transparent. Add turmeric powder, the fillets and the third extract of the coconut milk. Bring to boil and then simmer for 3 minutes, slowly turning the fillets. Add salt, tomato and the second extract of the milk and simmer for another 3 minutes. Remove from fire and add the first extract of the milk and bring to a boil over low flame. Sprinkle lemon juice and mix carefully and serve hot with rice. Soak the rice for 15 minutes and cook till half done. Cut the mutton and the chicken to cubes and boil the eggs. Boil the green peas and grind the garlic and ginger to a smooth paste. Heat oil in a pan and fry the onions and ginger, garlic paste. Add the jointed chicken and fry for sometime and then add 3 cups of water and cook till the meat is tender and 1/3 of the gravy is left. Add some ghee and the beaten curd and cook till the curd gets absorbed. Then add 1 tablespoon of rose water. In another pan make alternate layers of rice and cooked meat, take care that the first and the last layers are that of rice. Cook in an oven for 15 minutes on low flame. Garnish with fried onions, quartered boiled eggs and boiled green peas. Chicken 1 kg, boneless, cut into 1-inch cubes. Heat the oil and add the cinnamon,cardamom, cloves and the onions and fry till they turn brown. Add the ginger, garlic paste, tomatoes, turmeric powder, coriander powder and chilli powder and cook for three minutes. Add the chicken cubes and add water enough for cooking. Cook till the chicken is tender and the water has dried. Add curry leaves, cashews and pepper powder and cook for two minutes and then serve hot. Wash the rice and cook it in the thin coconut milk till it is soft and tender. Add the jaggery and stir till it dissolves. Add the thick coconut milk and cook on low flame for sometime. Remove from fire and garnish with ground green cardamom powder and fried cashews and raisins. Roast the gram flour with one tablespoon of ghee till it emits an aroma. Heat the sugar and water to form a sweet syrup and then add the roasted gram flour stirring carefully. Add in spoonfuls of ghee and allow it to boil. And when the ghee begins to separate, spread the mixture on a greased plate. Cut into desired shapes when hot and serve.